Check on the FS website that there arent 2 wives - one the correct one and one unknown. If you add parents to a child from RM, when the father is added, a placeholder mother is also added. Then when you add the mother, a second mother is added (the intended one). So, a child then has one father but 2 mothers, and you should be able to see that on the RM sharing panel. The marriage addition fails because you are attempting to add it to the father and dummy mother (who doesnt exist). 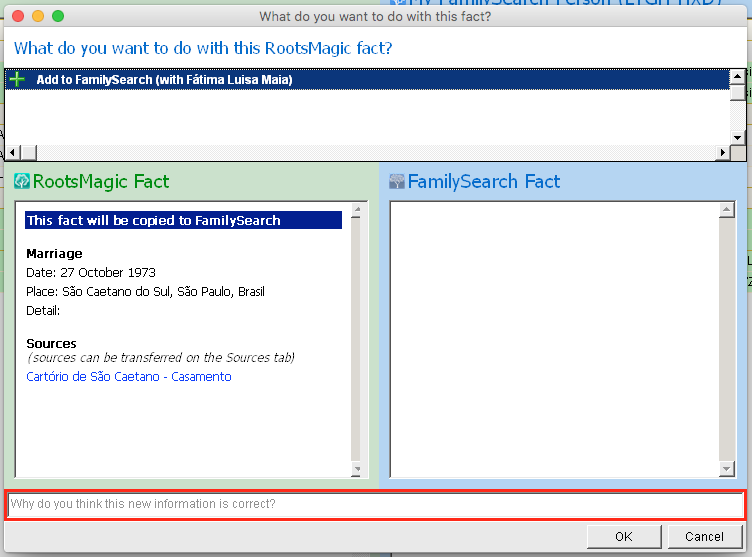 You need to delete on FS the connection between the child and the father connected to the dummy mother - this is the second connection to the correct father. Then the marriage will be attached to the correct father and mother. There may be better ways of avoiding this problem, in which case I would love to know it. This seems to be a problem stemming from wanting to use RM to build the backwards tree in FS (which most of us want to do, Imguess). I'm working on Mac, but I try to do the same process on Windows and I have the same error alert. A 404 error always means that the receiving system cannot find something that has been requested. In this case FS cannot find a record which probably means that FS has changed something in their API which in turn has affected RM. Until RM and FS work out the problem and implement a solution, you are stuck. Send an email to support@rootsmagic.com with a link to this thread to let them know there is an issue. I'm sending a message to them right now. Thanks. Just to register the feedback from RM support. The error that I related in this topic occour because the spouse is checked as living. With this scenario, FS block the operation and RM return the error that FS returns. I've suggest for RM to threat this error and return a user friendly message for the user. On FS, it's possible to put this information for couple when one person is checked as living, but it shows a warning message saying that information will be visible only for me.